Posted on January 26, 2017 at 10:01 pm. Washington’s youth have limitless potential. They’re the future of this state and the heartbeat of our communities. And when they succeed, we all succeed. Unfortunately, due to circumstances often beyond their control, too many young people have fallen into homelessness or are at risk of becoming homeless. In Washington state alone, 13,000 unaccompanied youth experience homelessness at some point each year. That’s enough to fill 185 school buses. And these are Washington residents—78 percent of unaccompanied homeless students began 9th grade in the state. We envision a future where every family and youth has the individualized support they need so that no young person has to spend a single night without a safe and stable home. In an increasingly polarized political climate, people on both sides of the aisle support this mission. That’s why, last summer and fall, A Way Home Washington co-chair and Washington state First Lady Trudi Inslee and Executive Director of the Office Homeless Youth Kim Justice, toured the state to learn what youth homelessness looks like in Washington state and how service providers are responding. We learned a lot from that listening tour about what is needed to better serve these young people. We also were blown away by the spirit of community that exists here. Washington state residents are stepping up—as service providers, volunteers, host home families, school employees, counselors, and more—to lend a helping hand to young people in need. People in Washington state feel a sense of responsibility for their community, and especially for the most vulnerable citizens. In order to prevent and end youth homelessness in Washington state, we need a roadmap that can help get us there. And while a map serves as a great guide to get us to our destination, we’ll need flexibility to navigate the twists and turns along the way. That’s why the Office of Homeless Youth released their Prevention & Protection Programs 2016 Report – a roadmap to help communities implement solutions that work for them. The report synthesizes input and expertise from countless individuals and organizations from communities across the state, both public and private. What’s more, a robust and concentrated effort was made to engage young people who are currently experiencing homelessness to provide the perspective and guidance from those who have lived through this unique and life-changing burden. This month, A Way Home Washington and the Office of Homeless Youth announced a directive from Governor Jay Inslee and proposed specific actions designed to prevent and end youth homelessness in communities throughout Washington state. This report lays out the key points and programs that can help us turn the tide on youth homelessness. That includes proposals like elevating the voices of those who have experienced homelessness, to specific policy proposals that can shed more light on the problem—such as a homeless youth liaison for every school. A Way Home Washington is committed to doing our part as well. We will provide state and local leadership, support and technical assistance to build a coordinated, youth-informed system that values family preservation, emergency response, long-term housing, and support services. We will build a movement to expand a sustainable base of support to ensure all youth are safely housed. To meet our goal of preventing and ending youth homelessness in our state, we need to work with communities across the state to implement the community-based, local solutions that will meet young people where they are and the circumstances they are in. We encourage you to read through the report and share with your partners, stakeholders, and friends. Together, we can prevent and end youth homelessness in Washington state. Posted on November 4, 2016 at 12:49 pm. What does youth homelessness look like in your community? What is working well to prevent and end youth homelessness? What else do you need to be successful? In separate conversations, youth with experiences of homelessness were given the opportunity to share their stories and feedback. A Way Home Washington’s youth co-chair, Esco Mustapha, moderated the conversation with young people in Everett, and highlighted how important youth voice is in this work. Four communities participated in this initial series of listening sessions: Yakima, Tacoma, Vancouver, and Everett. The sessions were hosted by key service providers in each community, who issued the invitations to other individuals and entities working with youth and young adults. The need for safe spaces for youth under the age of 18. Leaders in each community talked about the challenges assisting unaccompanied youth under 18. Increased shelter options, better relationships with child welfare, and host homes are some of the solutions being considered. Housing options are particularly challenging in rural areas, where provider capacity continues to be a major issue. Lack of affordable housing. Housing shortages in each community are not only driving up the numbers of overall homelessness, but youth homelessness, as well. Youth and young adults are particularly hindered in their search for housing due to lack of credit and rental history, inconsistent employment, or criminal records as a result of their homelessness. Community collaboration is key. Each community highlighted successful partnerships between schools, housing, and workforce partners. However, more is needed to break down silos and foster better collaboration between systems interacting with youth. More can be done to build awareness. Youth homelessness is often hidden and misunderstood. Honest and open conversations are needed to address this problem head-on. In Yakima, Rod’s House and Yakima Neighborhood Health Services convened the conversation at The Space, a LGBTQ drop in center that opened in June. The Space acts as a hub for services—a key ingredient for success. In addition to The Space, Yakima youth can also use Rod’s House as a central location for referrals to housing, healthcare, job training, and other basic needs. Yakima Neighborhood Health Services also shared their success with the BESTY House, a new partnership between YNHS, Rod’s House, the South Central Workforce Council and Educational Service District 105. These diverse partners are coming together to provide a supportive living environment for young women transitioning from extended foster care to independent living. This group living situation will provide housing, job coaching and education plans to set these youth on the path to successful adulthood. The Tacoma listening session took place at the Oasis Youth Center, in partnership with Community Youth Services. For over 30 years, the Oasis Youth Center has provided safe spaces for LGBTQ youth in Pierce County. With an estimated 40% of youth and young adults experiencing homelessness identifying as LGBTQ, resources like Oasis will play a critical role in the identification and response to this community. Community Youth Services, a long time service provider in the South Sound region, is working in partnership with the Tacoma Housing authority to site a new young adult specific housing shelter in Pierce County through a grant from the U.S. Department of Housing and Urban Development. This shelter will house 33 young people, ages 18-24, and provide them with services appropriate to that age group. In Vancouver, Janus Youth Services hosted the community conversation with the City of Vancouver. Janus Youth Services provides youth focused housing and a drop in center in Vancouver, with plans to expand their work to Cowlitz County in the near future. The Vancouver community also highlighted their school based work around the identification and assistance to homeless families and unaccompanied youth in the Vancouver School District. Their success is centered on family resource coordinators located in schools and will be expanded through a recent grant from the State of Washington under the Homeless Student Stability Act, which passed earlier this year. The last stop on the tour was hosted by Cocoon House in Everett. As a major youth provider in Snohomish County, Cocoon House has formed strong relationships with the schools and workforce community to get young people on a path out of homelessness through education and employment. According to Workforce Snohomish, 80% of the youth visiting their drop-in center identify as homeless. This community highlighted the importance of building trust between partners in this work. Service providers and school employees need to work together for quick referrals and interventions. This isn’t the case in every community, but a key element to success. Each community visited on the listening tour has found ways to respond to the unique strengths and challenges they face. Each community can share lessons around collaboration on housing, schools, employment and other services key to preventing and ending youth homelessness. Posted on October 11, 2016 at 10:01 pm. A Way Home Washington (AWHWA)—a movement to prevent and end youth homelessness in Washington state—today announced the hiring of Jim Theofelis as founding executive director. Theofelis brings nearly 40 years of experience serving children, youth and families, including 15 years as the founding director of the Mockingbird Society. As executive director, Theofelis will work with stakeholders across the state to strengthen and align research, policies, practices and funding to prevent and end homelessness in Washington state. Founded earlier this year, the movement works in concert with national efforts by A Way Home America and public sector leadership by Washington’s Office of Homeless Youth Prevention and Protection (OHY). 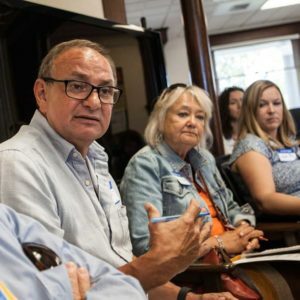 Theofelis’ hiring comes on the heels of a statewide listening tour by AWHWA co-chairs Esco Mustapha— a young person who has experienced homelessness—and First Lady Trudi Inslee. Coupled with a recent statewide report on youth homelessness, AWHWA hopes these insights and discussions will complement efforts by OHY as it develops the first statewide plan on the issue.